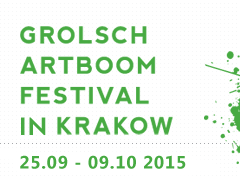 The first weekend of the Grolsch ArtBoom Festival, 6th edition, is behind us. Contemporary art has taken over Nowa Huta. In the Światowid Cinema, which is about to become the Museum of the People’s Republic of Poland, visitors can find The face of the day. Social costs in post-1989 Poland exhibition. 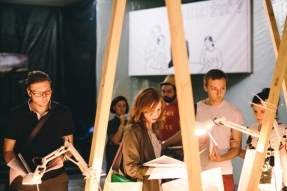 It is the central point of this year’s festival programme, reaching far beyond the borders of Nowa Huta, a district that provided inspiration for artists in the current edition of the festival. As indicated by Stanisław Ruksza, curator of the exhibition, the project was supposed to convey a global meaning. And this indeed worked out. The exhibition title was inspired by a book from the 1930s. Its author, Wanda Wasilewska, addressed the situation of Krakow workers who suffered in the aftermath of the Great Depression. The curator has paralleled that history with the present. He focused on the story of excluded groups that had been left at the margin of the transformation as Polish capitalism gained momentum. Homelessness, the decline of former workplaces and work ethics, as well as highly topical issues concerning the pracariat, i.e. people employed without permanent contracts, or the emergence of anti- and alter-globalisation movements – all these problems are covered in the works of 28 contemporary artists invited to the exhibition. Two television recordings became symbolic dividing lines in the project’s composition. First is the statement of Jacek Kuroń, Minister of Labour and Social Policy in 1989, talking about the necessity to fairly incur the costs of transition from communism to free market economy. The second recording is a discussion, or rather a TV quarrel, between Paweł Demirski and Michał Żebrowski about who benefited from the 1989 transformation. Between these two points, we can find e.g. the artistic project by Łukasz Surowiec presenting carts from an exchange deal: he offered homeless people from Upper Silesia to swap their old, dilapidated scrap collection carts for new ones. There was one condition – that the homeless person would consent to having their portrait done. An installation that illustrates homelessness but also hope for a better future was thus created. In her film The Weavers, Anna Molska allows unemployed miners to speak out using the words of an 1892 drama written by the German Nobel prizewinner Gerhart Hauptmann. This work of literature referred to the nineteenth century uprising of weavers in the Owl Mountains. The film asks important questions about the meaning of leftist demands formerly and today, social transformations and their costs. Marcin Maciejowski, in turn, asks in his depiction of the everyday life of Polish families a question What is it to live here today? A billboard work in black and white is not a commercial but an attempt to draw attention to the situation of the Polish people in the year 2000. Individual works of such well-known artists as Paweł Althamer, Grzegorz Klaman, Andrzej Tobis, Krzysztof Wodiczko, or Julita Wójcik, communicate with each other in various dialogues, and what holds them together is the eye-catching design by Łukasz Błażejewski. The exhibition setting suggests ongoing renovation, the proverbial Polish makeshift, or perhaps demolition? As though contrary to the above-described ones, projects displayed nearby, at the Centralny Square, are strictly associated with the context of Nowa Huta. The first one is Fountain of the Future by Małgorzata Szydłowska and Bartosz Szydłowski, a humorous work concerning serious issues. It is a mini statue of Lenin modelled after the one that once stood in Nowa Huta. But it looks somewhat different today: the revolution leader depicted in green is no longer dominant. And he is peeing water like the famous Brussels boy Manneken Pis. However, underneath this visual prank lies an important question, not only about the future of the district, but also the function of the Centralny Square as a time-spending area. It has long been discussed that e.g. a fountain could be installed there. Groups of Sunday strollers taking pictures at the spot seem to confirm that the project has fulfilled its task. The second work to see at the Centralny Square is the inscription Praise the people of Nowa Huta. A project by Sasha Kurmaz is made of simple flower beds arranged in the shape of words. It used to be a fashionable manner of urban green decoration, while today it is a relic of the past found on postcards from spa towns or from Nowa Huta, a city designed as a model, living monument of a bygone system. And what is still to come? Tomorrow at 9 pm, thanks to Paulina Ołowska and the curator Wojciech Szymański, the long out-of-order Markiza (Marquise) neon sign promoting a former cake shop of the same name at the Centralny Square will glow once more.